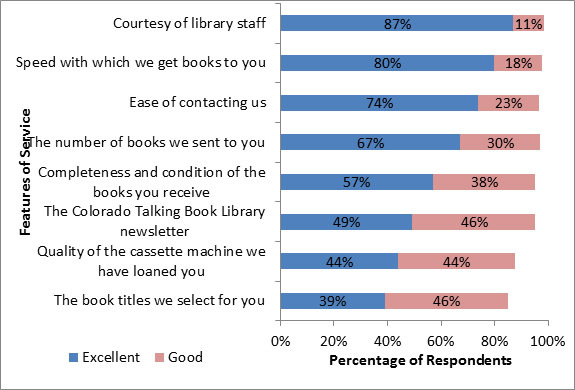 The Colorado Talking Book Library’s (CTBL) third patron satisfaction and outcome survey was administered in 2008. It is clear from the survey results and the comments left by respondents that the overwhelming majority of patrons are very pleased with CTBL service. 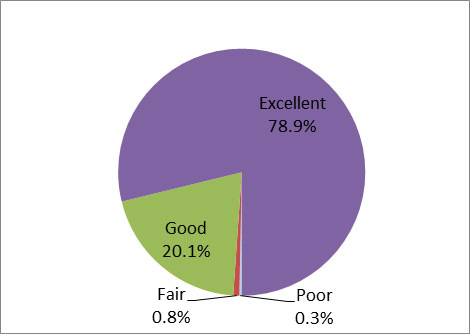 Overall satisfaction is exceptionally high—nearly all respondents (99%) rated CTBL as excellent or good (see Chart 1). 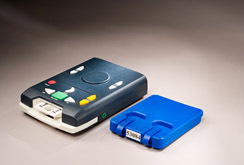 The Colorado Talking Book Library (CTBL) serves, at no cost to the user, over 13,000 patrons who, due to physical, visual, or learning disabilities, are unable to read standard print material. CTBL’s collection consists of 56,000 talking books, 5,000 titles in Braille, 14,000 titles in large print, and about 300 descriptive videos. CTBL is part of the Colorado State Library, a division of the Colorado Department of Education and is affiliated with the Library of Congress’ National Library Service for the Blind and Physically Handicapped (NLS). In addition to rating overall satisfaction with CTBL, respondents were asked to rate their satisfaction with selected features of CTBL service. Features were generally rated very well. The features that received the highest rankings were courtesy of library staff and speed with which books are delivered, both with 98 percent rated as excellent or good (see Chart 2). Even the 2 lowest rated service features—quality of the cassette machine and the book titles selected—still received very high ratings, with almost 9 out of 10 respondents indicating a good or excellent rating. The Library loans the cassette playback machines free of charge to its patrons. The survey also asked respondents how CTBL has been valuable to them. Reading for pleasure was by far the most frequently selected outcome of CTBL, with 8 out of 10 respondents citing that as valuable (see Chart 3). The next most valued outcome of CTBL use, with more than 1 in 3 respondents selecting it, was learning more about a personal interest. About 1 in 6 found information needed for school and 1 in 10 stayed connected to their community. Note: Respondents could select more than 1 outcome. Results of the 2008 CTBL patron satisfaction survey were very similar to the previous 2 surveys in 2004 and 2006. Most satisfaction ratings varied only slightly from previous years with respondents indicating high satisfaction levels. This was also true of the most frequently selected outcomes of CTBL service. However, there were a few exceptions. The quality of the cassette machine loaned to the patrons was also rated differently in 2008. Combined ratings of excellent and good dropped from 96 percent and 94 percent in 2004 and 2006, respectively, to 88 percent in 2008. The decrease in ratings is possibly due to the cassette machines aging. This problem is being addressed statewide and nationally with the adoption of a new digital talking book player, which will be distributed to patrons starting in fall 2009. The new digital talking book player will be about the size of a cassette and will weigh almost 5 pounds less than the traditional talking book player. Clearly, the vast majority of patrons are satisfied with CTBL service. Nearly all respondents rate their overall satisfaction with CTBL and individual service features extremely high. In addition to high ratings, the comments received from survey respondents reflect how much CTBL means to its patrons. Patrons appreciate CTBL for keeping them informed, entertained, and connected to their communities.